Mangalore University Result 2018 has been released. Candidates can check Mangalore University Degree Result from this page. The university has released UG, PG Nov/Dec 2018 Exam Result. To check Mangalore University Result candidates “Register Number” is required. Candidate should score minimum marks required to qualify in the semester exam. Qualifying candidates will be promoted to next semester. Final year candidates qualified in all the semester will be eligible for the degree certificate. The University will issue the marks card to all the students appeared in the exam. Candidates will be able to apply for the revaluation of the answer sheet after the dates declared by the university. Check this page for Mangalore University Results 2018. Latest: Mangalore University has released the result for MA, M.Sc, M.Ed Sem 1 and 5 Exam 2019. Mangalore University releases the semester exam result online. To pass in the exam candidates must score minimum 35% marks and above. The result of pass candidates at the end of 6th Sem shall be based on the basis of aggregate marks obtained in all the six sem and the aggregate GPA. The semester result is declared in terms of grades. Check the table for Mangalore University Results 2018. 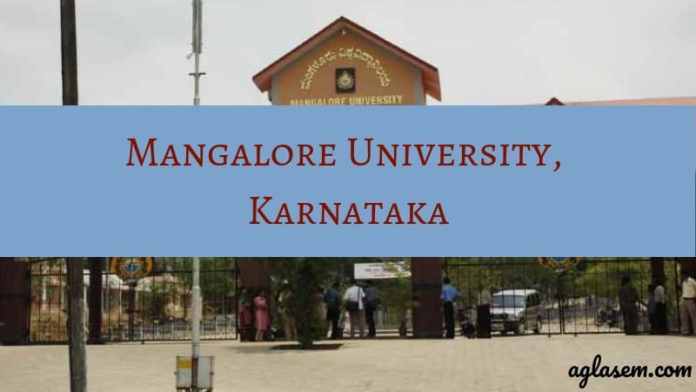 Result: Click here to check Mangalore University UG and PG Nov/Dec 2018. Result: Candidates can check Mangalore Univerity Odd Sem Result from the official website ie, mangaloreuniversity.ac.in. How to Check Mangalore University Result 2018? Candidates appeared for the semester exam conducted by the university can check the result through the link provided in the table. Click the link and follow the steps mentioned below. Check the class classification on the basis of aggregate marks. After the declaration of the result candidates will be able to apply for the revaluation of the answer script. In the revaluation process, the answer script is completely rechecked. Candidates who wish to apply for the revaluation of the answer script has to submit the revaluation form. The revaluation of the answer script is a chargeable process. Candidates have to pay for the revaluation of the answer script as prescribed by the university. It is notified that the revaluation is done for theory paper only. The University conducts theory and practical exam at the end of each semester. The odd semester exam is conducted in the month of Oct/Nov and even semester exam during April/ May. Candidates have to register for all the papers of a semester when he/she appears for the exam of that sem for the first time. Candidates have to submit the record book for the practical exam duly certified by the course teacher and HOD/staff in-charge. Candidates have to score minimum qualifying marks to pass the exam. If a candidate fails either in theory or practicals, then he/she shall appear for the particular subject only at any subsequent regular exam, within the period prescribed for completing the programme.